A masterpiece in construction, color, and design, our Mitered Corner Blanket is as close as you can get to painting with yarn. 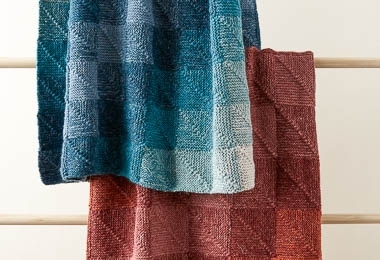 Using Linen Quill doubled, both palettes of this blanket ripple through color with stunning beauty (and no sewing!). You just knit each square from corner to corner, then pick up stitches along one or two sides of adjoining squares to continue with the next one, gradually gliding from one combo of colors to another... The perfect get-involved project! Our Mitered Corner Blanket Bundles are available in two color palettes: Warm and Cool, and two sizes: Small Throw and Large Throw. The images here feature the Cool palette in the Small Throw size (3 x 3-inch squares) and the Warm palette in the Large Throw size (4 x 4-inch squares). And for more information, please click Product Details, above. NOTE: For the Small Throw, we only used a little bit of the third skein of Color E. If you leave the skein unwound, you can exchange it if you don’t end up needing it (click right here for Purl Soho’s return policy). Each Small Throw square should be 3 x 3 inches; each Large Throw square should be 4 x 4 inches.